The El Estacio de La Manga bridge, the only navigable channel between the Mar Menor and the Mediterranean, provided another scare on Tuesday morning when an alarm went off in the communication system of the bridge’s electronic support unit, forcing it to cancel all openings and losings as a preventive measure. “The alarm signalled an error, which the engineers are trying to correct. But, as a security measure, the mayor decided not to opening the bridge so as to avoid possible greater problems, “explained the Councilor of Tourism of San Javier, Antonio Martinez. The operators fear that, if the bridge is opened so that larger boats can move through, the computer error might prevent its closure, which would then create serious traffic problems during the final few days of August, as many tourists are attempting to leave the resort and as new guests arrive. Those who know the area will appreciate that El Estacio is the only road linking the north and south of La Manga. The mayor said that “the maintenance engineers are working to detecting the error and are in permanent contact with the engineers of the German company that built the bridge.” He added that he was confident that the solution would be found within a matter of hours. Closing of the bridge mainly affects sailboats whose masts exceed 7 metres. Motor yachts don’t usually have problems navigating between the two stretches of water without having to wait for the bridge to open, which happens every two hours in the summer between 8am and 10pm. The last time the bridge suffered a similar breakdown was at the beginning of the year in January when a fault caused the bridge to remain closed for a week while spare parts were shipped from Germany to resolve the problem. 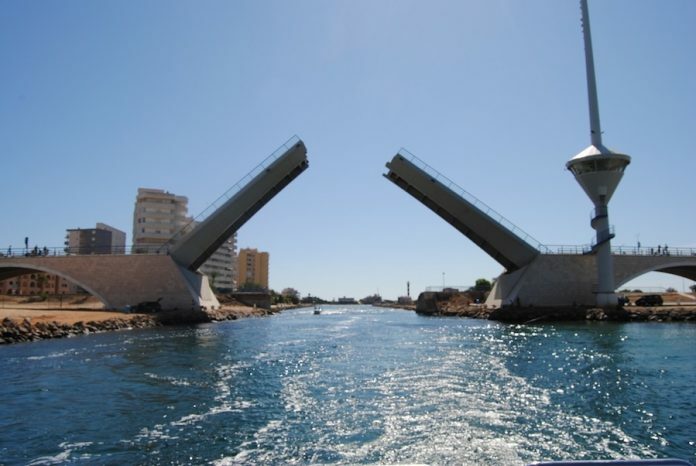 The maintenance of the bridge El Estacio costs 116,651.62 euros a year and up to now it has been the municipality of San Javier that have paid the full amount, since neither the Autonomous Community nor the other coastal town councils are willing to collaborate in the financing.